The Secret 6 face their greatest challenge yet when a vicious horde of giant dogs invade Manhattan, ripping apart innocent citizens at random! No sooner are these creatures vanquished, than the rampage continues - this time conducted by marauding men as gigantic as Paul Bunyan! What is the evil purpose of this plague of man - monsters? Who commands them? Why are they slaying people with impunity? Can they be stopped before they crush everything in their path? As the heroic King and his fighting fugitives plunge into this maelstrom of mystery, they begin to piece together the astonishing secret behind The Monster Murders. Hint: It's worse than they imagined. 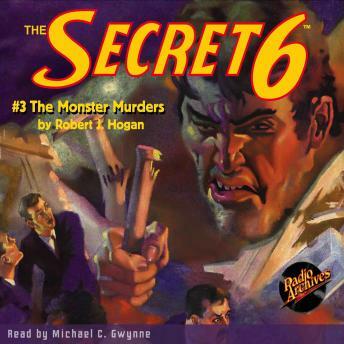 The Monster Murders first appeared in the December 1934 issue of The Secret 6 magazine.